The Season 1 Battle Pass for Apex Legends is scheduled to kick off on March 19 and features over 100 different rewards as well as new content for players to sink their teeth into. For those contemplating whether or not to purchase the Season 1 Battle Pass, which is priced at 950 Apex Coins, it helps to know which rewards are up for grabs. To help clear everything up, we’ve put together a quick guide explaining what the Level 100 reward is in the Season 1 Battle Pass for Apex Legends! The Level 100 reward for the Season 1 Battle Pass in Apex Legends is a Legendary weapon skin for the Havoc Energy Rifle. As noted above, the Season 1 Battle Pass in Apex Legends features over 100 different rewards for players to earn. By playing the game and earning XP, players will be able to progress through the rewards list until they reach the max Level 100 reward. On EA’s website, a Battle Pass page for Apex Legends has gone live featuring a look at all 100 rewards available in the Season 1 Battle Pass. By selecting the 95-100 tab, you’ll be able to view the top rewards including what’s up for grabs for players who reach Level 100 of the Battle Pass. 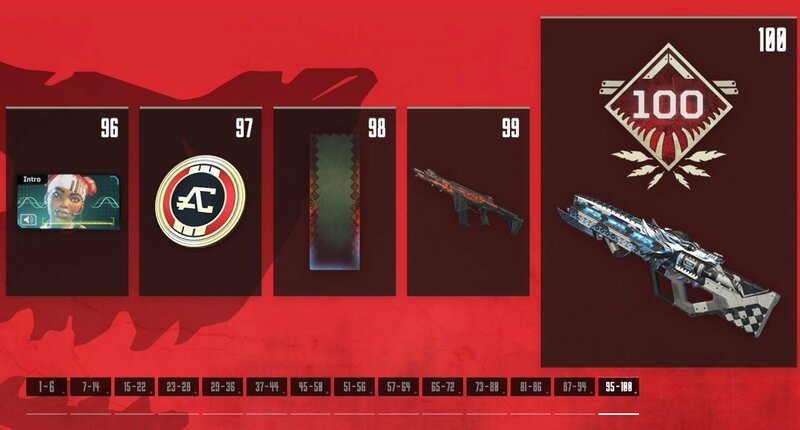 While no specific details have been listed, the visual accompanying the Level 100 reward depicts a Legendary skin for the new Havoc Energy Rifle. Respawn has confirmed that this will be an evolving weapon skin that changes as you complete further challenges or levels in the Battle Pass. The design itself appears to be a blue dynamic skin with a wolf head in the center. Browsing through the other rewards tabs on EA’s website, you can see skins for other weapons listed as Season 1 Battle Pass rewards along with cosmetics for Legends like Lifeline. Speaking of Legends, a brand new Legend will release alongside the Season 1 Battle Pass called Octane. For players uninterested in purchasing the Season 1 Battle Pass, the good news is that Octane is available to all players not just Season 1 Battle Pass holders. Similar to Legends like Caustic and Mirage, Octane can be unlocked in exchange for Legend Tokens. Now that you know what the Level 100 reward is in the Season 1 Battle Pass for Apex Legends, what are your thoughts? Do you think the Season 1 Battle Pass is worth its purchase price of 950 Apex Coins? Let us know down in the comments below!